Are you throwing a Halloween party, or are you simply looking for a great trick-or-treating soundtrack? 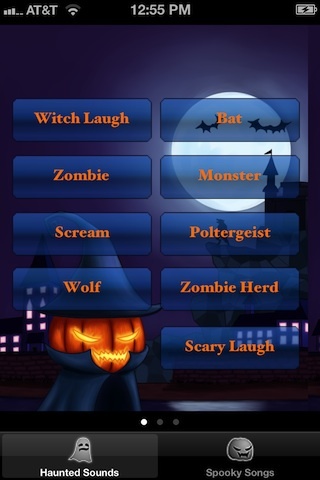 The Scare Taptics iPhone app gives you fun, high quality Halloween noises and sounds in a simple, intuitive interface. The graphics and navigation have a straightforward, kid friendly Halloween vibe. The home screen is an attractive night scene containing a cloaked pumpkin witch juxtaposed with a haunted mansion lit by a full moon. Special touches like bats and jagged cliffs further enhance your experience. The Scare Taptics soundtrack selections are sorted with one touch by a ghost icon to access haunted sounds or a frowning pumpkin icon for spooky songs. The sounds and songs are a simple matrix grid with bright orange labels for easy selection. The Scare Taptics sound and song selections are not only organized well, but the quality of the audio is also excellent. There are 27 haunted sounds available, and they range from witches and zombies to possessed child and headchop. The more gruesome sounds are not so terribly frightening to put off younger children. The spooky songs have four selections: scary, frighten, prey, and haunted. These are less compelling than the sounds, but it does help to have a longer play time. The haunted sounds are fairly short. A neat touch is the ability to play a song and layer sounds on top of it. The Scare Taptics iPhone app is free, and it has nice functionality and tools for the price. It would be perfectly reasonable to charge $.99 and add the ability to create a custom soundtrack of the sounds and the chance to put sounds and a custom soundtrack on repeat. The Scare Taptics iPhone app is a solid choice in its current state, but it has the bones to frighten all of the Halloween sound app competition. AppSafari review of Scare Taptics was written by Jenni Ward on November 13th, 2012 and categorized under App Store, Free, Fun. Page viewed 3084 times, 1 so far today. Need help on using these apps? Please read the Help Page.